​Community Development Block Grant funds area available to City and County governments to implement scattered site housing rehabilitation projects. Local governments can apply for funds up to $1 million to address low income homeowner occupied dilapidated housing in their jurisdictions. ​The National Affordable Housing Act of 1990 created the HOME Investment Partnerships. One of the major objectives of the program is to aid the preservation of existing housing units owned and occupied by households whose incomes fall below 80% of the area median income as determined by HUD. 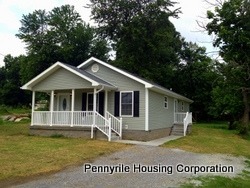 The Pennyrile Housing Corporation has been successful in receiving approximately $2.5 million in housing rehabilitation funds, assisting over 205 families in the repairs of homes. If you're interested in participating in this program, you may DOWNLOAD THE APPLICATION. You'll need Adobe Acrobat Reader (available free with the link at the bottom of this page) if you don't already have it on your computer. ​Through funding received from Kentucky Housing Corporation's Nonprofit Production Program for the Area Development Districts, we are able to make individual loans to owner occupied residences that are in need of small repairs. These loans can be made in the amount of $1,000 up to $15,000 at 6% over a 10 year period. These loans can be in either a first or second position mortgage. We look at each family's income, debt, and credit before determining eligibility for the program. For further information contact Amy Frogue at 270-886-9484 or [email protected].